"I have no time for multicultural education because I have standards to follow and my students have tests to pass." We hear this a lot from teachers, and this view of multicultural education is frequently reinforced by school leaders and professional developers who are concerned that teachers teach to standards (Common Core is the big one right now). To begin thinking critically about this concern, write down on a sheet of paper what you believe are any relationships between multicultural education and student academic learning. Then, if you are working on this exercise with a colleague, discuss what you wrote. To what extent did your ideas focus on developing students’ cultural awareness? Helping students from diverse backgrounds get along with each other? Teaching about social justice issues? While multicultural education includes these things, there is much more to it than that. In addition to teaching about social justice, our teaching should embody social social justice, including nurturing all students’ academic identities and learning. Look at the five student outcomes we use to conceptualize multicultural education in the classroom. Then read the page “Positive Student Academic Identities.” How does elementary teacher Marisol Moreno use multicultural education to deepen student academic learning? How does elementary teacher Pang Hlub Xiong zero in on how her students’ learn best to teach them? Both teachers illustrate relationships between multicultural education and student academic learning. How is their work supported by the research evidence on that page? Now let’s go back to your classroom and the standards you are expected to teach. Think about something you will be teaching next week or next month. What standard does it address? 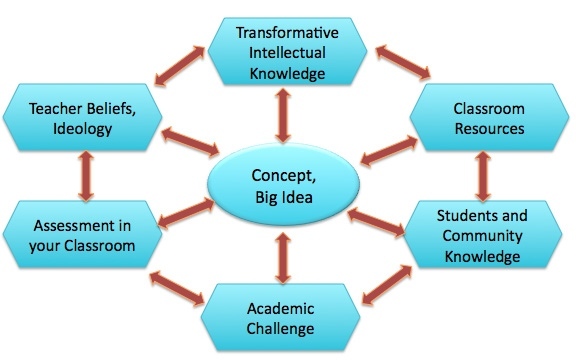 If you are familiar with Wiggins and McTighe’s Understanding by Design, what “big idea” will you be developing? You want something that is focused enough to teach, broad enough to allow “room to maneuver, “ and potentially meaningful to your students. The diagram below represents Christine Sleeter’s approach to going from your standards to meaningful, multicultural and culturally responsive teaching, elaborated in her book Un-Standardizing Curriculum. Here, we will not take you through the discussion about each box in the diagram and their interrelationships. You can read a little more about each part of the diagram by clicking here, and the book Un-standardizing Curriculum discusses and illustrates in considerable detail. Teaching Tolerance makes available resources for building literacy-based anti-bias learning plans. Again, you start with an essential question that is aligned with your standards or learning goals, then work from there. The point that is important to understand is that you can begin with the standards, or any other central concepts and skills you are expected to teach, and develop them from a multicultural perspective. Equally important is to understand that multicultural education gives you conceptual tools for teaching your students better. By building relationships with them and finding out what students are interested in, how they learn best, what they want to learn and what is meaningful to them, you can tailor your standards-based teaching to fit your students. It is no accident that multicultural educator Marisol Moreno’s class is the highest-achieving in her school.